Studying endometriosis is like nailing Jell-O to a tree. Clinical descriptions suggesting the presence of endometriosis were first written almost 4,000 years ago (Redwine 2012, Nezhat 2012). But a microscopic description did not occur until 1860 when Rokitansky described the histologic characteristics of either ovarian endometriosis or endometrioid cancer. The difficulties in recognizing endometriosis were noted by Russell (1899) who discovered small, unseen, microscopic, intra-ovarian endometriosis and endometriosis hidden by ovarian adhesions. Sampson (1921 & 1927) subsequently found endometriosis within deep cul-de-sac adhesions. Sampson published a series of articles from 1921 to 1940 in which he first used the term endometriosis in 1925. He discussed that endometriosis was different than endometrium "both in structure and in function," both could coexist in one patient with a recognizable transition, and an associated inflamatory reaction was similar to that seen in cancer and infection. Sampson concluded that retrograde flow does not explain all endometriosis and suggested additional theories, such as celomic metaplasia or venous dissemination. He described lesions including chocolate cysts, blebs, adenomyomatous infiltration, adherent surfaces, red raspberries, purple raspberries, blueberries, deep infiltration, inflammatory reactions, peritoneal pockets, and cancer arising in endometriotic implants. 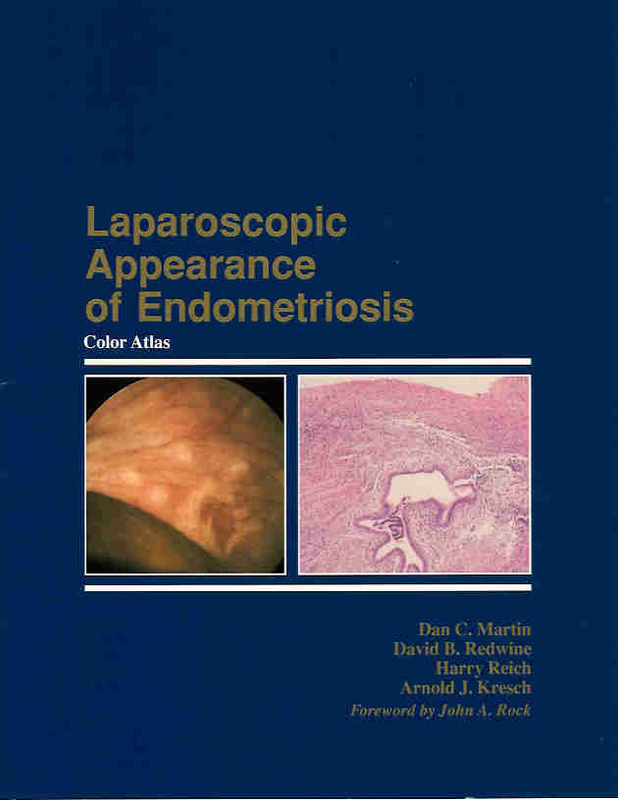 Fallon (1950) added to our understanding with clarification of colorless, amenorrheic lesions while Karnaky (1969) published an age dependent appearance of endometriosis starting with an initial water blister appearance. Of the more than 220 concepts and theories since 1855 BC covered in "Endometriosis Concepts and Theories," it generally takes eighteen to discuss what I saw or published and many more to introduce what I have read. But, those are only a small sampling of the more than 26,331 articles in PubMed (NIH), 357,000 articls listed in scholar.google.com and 291,000 array- and sequence-based data in the NIH GEO database. 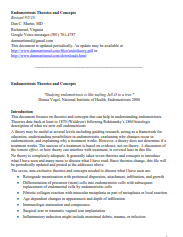 An endometriosis concept or theory may be useful in guiding research, explaining treatment, acting as a framework for education, and studying endometriosis. However, no concept or theory is completely adequate or determines if a treatment works. Treatment should be based on evidence of success and updated as knowledge changes. Theories are divided into the Cell of Origin, Dissemination / Metastasis, and the pathophysiological Transition from an original endometrial or precursor cell to endometriosis. The transition from a cell of origin to deep infiltrating endometriosis holds significant promise for research and development of therapeutic options. Transition involves the local environment, inflammation, epigenetic changes, genetic changes, biochemical changes, immunologic changes, apoptosis, autophagy, fibrosis, muscular metaplasia, cancer-associated driver mutations, angiogenesis, genetic dysregulation and more that are covered in "Concepts and Theories." David Adamson's Endometriosis Fertility Index (EFI) is a clinical tool used to predict pregnancy rates after endometriosis surgery. It is the only system that is predictive of fertility, but is not a staging system. The EFI has 6 levels and is based 50% on history, 30% on surgical findings at the completion of surgery, and 20% on the American Fertility Society (rAFS) total and endometriosis sub-total scores. The revised American Fertility Society (rAFS) and American Society of Reproductive Medicine (rASRM) staging systems are the staging systems most commonly used at surgery but are not predictive of fertility. The 1984 rAFS staging system was renamed the rASRM staging system in 1996 after that organization changed their name. The two are otherwise the same. Thgey can be used to describe the appearance at surgery and is somewhat predictive of surgical difficulty. The rAFS/rASRM has 150 points. A score 40 or higher is stage 4. The system separates stage 4 into scores for 4A (40 to 70 points) and 4B (71 to 150 points). Scores of 71 and higher are generally seen with severe adhesions. Adhesions are a type of scar tissue that can block the pathway that eggs use to get from the ovary to the tube. Is there a stage 5 endometriosis? Michel Canis (1992) suggested using a revised American Fertility Society (rAFS, 1985) score of >70 as a new stage 5 for endometriosis. This is also the 4B sub-score of the Endometriosis Fertility Index (EFI) (Adamson 2010). The EFI is a clinical tool used to predict pregnancy rates after endometriosis surgery. It is the only system that is predictive of fertility, but is not a staging system. The EFI has 6 levels and uses the 1985 rAFS staging system’s total and endometriosis sub-total score separately. The rAFS (or rASRM) is the staging system most commonly used in surgical research. It is useful in comparing the gross appearance at the beginning of surgery and is somewhat predictive of surgical difficulty. But, it is not predictive of fertility, pain, the depth of infiltration, or the volume of infiltrating endometriosis. The rAFS has 150 points. A score of 40 or higher is rASRM stage 4. The EFI separates stage 4 into scores for 4A (40 to 70 points) and 4B (71 to 150 points). Scores of 71 and higher are generally seen only with severe adhesions. Adhesions, a type of scar tissue, can block the pathway that the eggs use to get to the tube. Canis M, Pouly JL, Wattiez A, et al. Incidence of bilateral adnexal disease in severe endometriosis (revised American Fertility Society [AFS], stage IV): should a stage V be included in the AFS classification? Fertil Steril 1992;57:691–692.